Spectacular fine art photography from California's Coastal Oak hills, valleys, and Santa Monica Mountains. The California chaparral is one the most under photographed ecosystems in the state. The Santa Monica Mountains run east to west from southeast Ventura County they run east into Los Angeles County rising above the City of Angeles, then widen to meet the curve of the Santa Monica Bay, reaching their highest peaks facing the open ocean. The land is beautiful and diverse. The rugged coastline has many sandy beaches and rocky shores. Dense chaparral and fragrent sages cover the canyon walls. Wildflowers cover burn areas in a carpet of color in the springtime. Inland, lone valley oaks accentuate the grassy hillsides. In 1978 Congress established the Santa Monica Mountains National Recreation Area as part of the National Park System. 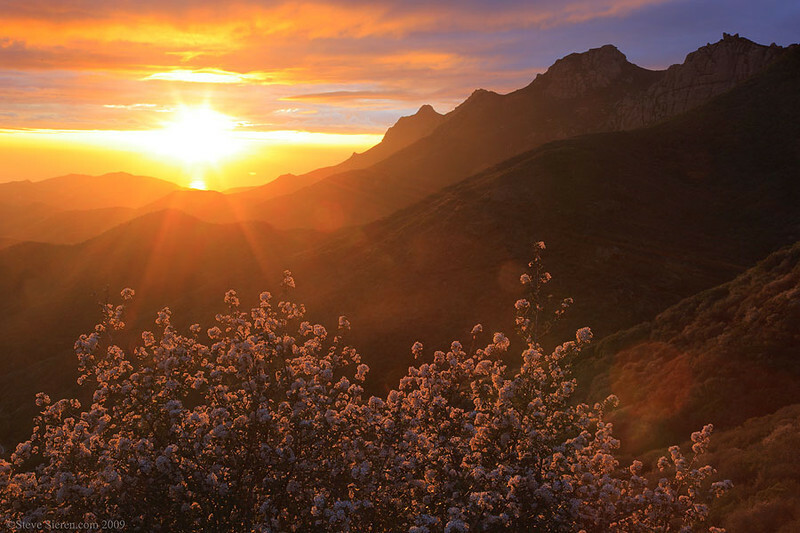 Sunset in the Santa Mountains with the Tri Peaks in view and blooming california lilacs in the foreground. A beautiful example of the Santa Monica Mountains.